They knew his name, the man who tried to brutally attack twelve-year-old Madeline in her grandmother’s hotel. They thought they knew his fate. He wouldn't be bothering them anymore…ever. Still their lives would never be the same. Secret Sisters is part romance, part mystery, part family drama, and one hundred percent gripping entertainment. Jayne Ann Krentz knows how to hook readers and keep them on the edge of their seats, and that’s exactly what she does in this novel. Madeline and Daphne were childhood best friends, until one fateful night when Madeline was attacked on the grounds of her grandmother’s hotel. The perpetrator died that night, but left behind information others would kill to possess. Only five people knew what really happened all those years ago, and now two of them are dead. It’s been eighteen years, but it’s clear someone wants the information Madeline’s attacker possessed, and they’re willing to kill to get it. Now Madeline and Daphne have to return to the scene of the crime and solve an old mystery before someone takes them out. But they won’t be going alone. Madeline knows she can’t trust just anyone with the truth, so she asks for the help of her new security expert, Jack Rayner. With the help of Jack and his brother, Abe, Madeline and Daphne will unravel the secrets of one powerful, dangerous family who will do anything to stop them. I love a good mystery and Ms. Krentz takes readers on an action-packed journey as Madeline, Jack, Daphne, and Abe dodge killers and put the puzzle pieces together. Secret Sisters has fantastic twists and turns and a compelling storyline that made it difficult to put the book down. But an exciting mystery is nothing without great characters and Ms. Krentz has delivered some great ones. Madeline and Jack are the center of the story and they’re both strong-minded, wary individuals. Jack has hard edges and a heart of gold, but his past makes him hesitant to trust people. Something about Madeline calls to him, though, and it’s easy to see why each of them couldn’t resist the other. Madeline is a tough businesswoman with a sharp mind you have to respect. She also has scars that have never been able to heal because her attack had to be kept secret, and this adds a vulnerability to her character that broke my heart. She and Jack have excellent chemistry and he complements her perfectly. Their romance was brimming with potential, but it never quite reached it because the focus of the story was more on the suspense storyline. The secondary romance between Abe and Daphne was also more in the background, which was a pity as well because these two were a lot of fun. If I had one wish for Secret Sisters, it would be that the love stories were better developed. Yet even taking this into account, I loved this book. The story is compelling, the characters fascinating, and the suspense is top-notch. 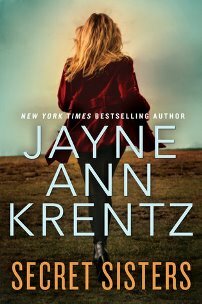 Jayne Ann Krentz is a master of several genres and her talent for writing romantic suspense shines in Secret Sisters.